Catladyland: Cats are Funny: Happy New Year from Cats ... and Boxes! 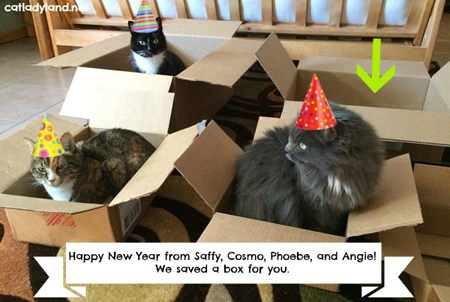 Happy New Year from Cats ... and Boxes! Catladyland opened its bloggy doors in January, 2009 -- I can hardly believe it's been seven years! There's never been a shortage of wacky -- and sometimes informative -- material from which to draw, and we've loved sharing every single laugh and thoughtful moment with you. So THANK YOU for visiting Catladyland, and we hope you'll continue to enjoy your mini-vacations to our silly little corner of the Web, where the litter boxes are always welcoming and the cats are usually snarky ... in the best possible way, of course. Here's to another year of fun!